Understanding "The Grapes of Wrath"
1940 John Steinbeck wins the Pullitzer prize. “To finish is sadness to a writer – a little death. He puts the last word down and it is done. But it isn’t really done. The story goes on and leaves the writer behind, for no story is ever done.” Memorable years selected by alumni, Prifysgol Cymru, Aberystwyth, University of Wales. About John Steinbeck. The National Steinbeck Center is home to a museum and library devoted to this winner of the Nobel Prize for Literature and the Pulitzer Prize. Biography of John Steinbeck, his Books & Movies, the relationship between Steinbeck and Salinas, Facts, Awards, & Honors, Museum Archives, John Steinbeck Exhibition Hall and Links. A Bard for the Powerless: The Steinbeck Centennial by Lisa Rogers, Humanities, Nov./Dec. 2001, Vol. 22, No. 6. 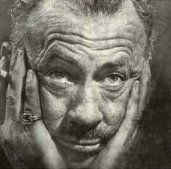 Biographical Sketch of John Steinbeck from John Steinbeck Collection - Steinbeck, John, 1902-1968, Collection, 1926-1977 - Harry Ransom Humanities Research Center, University of Texas, Austin. Biography of John Steinbeck. Brief biography, chronology, homes and locations, Steinbeck country, Pigasus (the flying pig). A Brief Chronology of Events in John Steinbeck's Life, by Robert Harmon - in PDF, 6 pages. 1902-2002. Center for Steinbeck Studies, located at San José State University, is the largest Steinbeck archive in the world housing over 30,000 items including manuscripts, original letters, film memorabilia, and over 800 photographs. This site provides details of Steinbeck's life and work, his 1962 Nobel Prize Acceptance Speech, as well as a virtual tour of Steinbeck homes, locations, and Steinbeck country, Sources for Further Reading, and more. Early Twentieth Century - John Steinbeck (1902-1968). PAL - Perspectives in American Literature - A Research and Reference Guide. External links include: Steinbeck House - John Steinbeck's Birthplace and Boyhood Home. Internal links include: Primary Works, Selected Bibliography, The Grapes of Wrath (1939), and Study Questions. John Ernst Steinbeck (1902–1968). Biography of Steinbeck from Oprah's Book Club. "What makes John Steinbeck so fascinating? His quirky personality? His unique world view? ... A shy man. A class act. A visionary. An experimental writer." Listen to Steinbeck Biography from NPR. Life and Times of John Steinbeck - Timeline. Steinbeck Goes to the Movies. John Ernst Steinbeck (1902-1968). Birth: Feb. 27, 1902. Death: Dec. 20, 1968. Author. "He was a prolific writer who wrote scores of novels, short stories, anthologies and covered World War II as a war correspondent for the “New York Tribune”. His frequent topic was the plight of the misfits, homeless and the hopeless." From Find a Grave Memorial, with photos. John Steinbeck. Biography from eNotes with photo. John Steinbeck FBI Files. View an actual Memorandum dated July 20, 1965: "Although he has never been investigated by the FBI, he wrote Attorney General Biddle in May, 1942, as follows: 'Do you suppose you could ask Edgar's boys to stop stepping on my heels? They think I am an enemy alien. It is getting tiresome.'" John Steinbeck - Biography. Brief biography of John Steinbeck, Winner of the Nobel Prize in Literature 1962. Site includes Steinbeck's Presentation Speech, text of his Banquet Speech, and Other Resources. John Steinbeck Collections from Stanford University Libraries. The John Steinbeck Life, Books and Awards Timeline. Dates Books Published, Awards and Honors, Personal Life Events, from Monterey County California Regional Search Engine and Guide. John Steinbeck: The Centennial by Clay Smith, Austin Chronicle. "... after The Grapes of Wrath was published, the governor of Oklahoma denounced it as unrealistic. A promotional article about Steinbeck from the Thirties loudly proclaims that 'America was proud of its front porch until John Steinbeck showed the backyard' ..."
John Steinbeck: The Grapes of Wrath. Brief biography of Steinbeck and brief Summary of The Grapes of Wrath from AmericanWriters.org. A companion site for C-SPAN's special television series, created by Cable, offered as a Public Service. American Writers II: The 20th Century. Meet the Writers: John Steinbeck. Biography and interview from Barnes & Noble. Book-a-Minute Classics: The Grapes of Wrath. An ultra-condensed humorous synopsis. Summarizes the entire novel in one succinct sentence. The Grapes of Web is the contribution of Librarians' Index to the Internet (lii.org) to California's Statewide Reading Program. Topics include:John Steinbeck, The Dust Bowl, The Novel, The Great Depression, The Film, The New Deal, Music, Route 66, Humor, Oklahoma, Dorothea Lange, Agricultural Laborers, Book Clubs & Statewide Reading Projects, and Library Programs. Why does Steinbeck devote a chapter to the land turtle's progress on the highway? Why does the book start with drought and end with floods? Does nature function as a force for either good or evil in this book? and many others. Steinbeck Bibliography: Grapes of Wrath Criticism. Annotated bibliography of 18 critical articles, arranged in alphabetical order by critics from to August to Wiener, e.g. August, Eugene. “Our Stories/Our Selves: The American Dream Remembered in John Steinbeck’s The Grapes of Wrath.” University of Dayton Review 23.3 (1996): 5-17. Wiener, Gary, ed. Readings on The Grapes of Wrath. Greenhaven Press Lit. Companion to Amer. Lit. San Diego: Greenhaven, 1999. Steinbeck: The Grapes of Wrath from Western Washington University. Includes Book Blurb from Penguin 1976: "The epic story of the Joad family's migration from the Oklahoma dust bowl to the promised land of California," Printing History, Main Characters, Dustjacket from the First Edition, Movie Poster (1940), Maps, Battle Hymn of the Republic, plus Notes and Links. Steinbeck's Myth of the Okies by Keith Windschuttle. From The New Criterion Vol. 20, No. 10, June 2002. In this article, Windschuttle argues that the story in The Grapes of Wrath has little connection to the history of the Great Depression or the experience of the great majority of the Okies. Why Read John Steinbeck? by Susan Shillinglaw, originally published in The Californian. Book Club Questions for The Grapes of Wrath from The Martha Heasley Cox Center for Steinbeck Studies, San José State University. Bookwolf Online Free Booknotes: The Grapes of Wrath. Contents: Context - Chapter Summaries and Interpretations, The Author, Characters, Chapters 1-30, and Questions. (Pop-up ads). ClassicNote on The Grapes of Wrath. Contents: About the Author John Steinbeck, Short Summary of the Novel, Full Summary and Analysis, Character List, Summary and Analysis of Chapters 1-30, plus Essays: Contrasting the Movie and Novel Form of the Grapes of Wrath, Four Pages of Fear, Hostility, and Exploitation, and All in the Family in The Grapes of Wrath. The Grapes of Wrath by Ed Stephan of Western Washington University, Bellingham WA. Site provides excellent resources for the serious scholar. Includes detailed analysis of the novel, complete with chapter by chapter plot summary and descriptions of major characters. You will also find an illustration of the Dustjacket from the First Edition, Movie Poster (1940), Map showing places mentioned in Chapter 12 of The Grapes of Wrath, another colorful map showing the setting for Chapters 18-30, Notes and Links to the Bible - Revelation 14:19, Migrant Labor Camp Photographs, 1935-6, 1940 Grapes of Wrath movie directed by John Ford, Smithsonian's Dust Bowl exhibit and Dustbowl Storm video, Historic Route 66, and more. Grapes of Wrath by John Steinbeck. A Reading Group Guide from ReadingGroupGuides.com. About This Book, Discussion Questions, For Further Reflection. Grapes of Wrath eNotes. Contents: Grapes of Wrath: Introduction, John Steinbeck Biography, List of Characters, Historical Background, Chapter-by-Chapter Summary, Discussion and Analysis (Chapter-by-Chapter Critical Commentary), Character Analysis, Complete Critical Essays on Various Topics, Chapter Quizzes (Chapter-by-Chapter Questions and Answers), Suggested Essay Topics, and Sample Essay Outlines. PinkMonkey Literature Notes on The Grapes of Wrath edited by Diane Sauder. An excellent source for an organized and structured study of the novel. Contents: Key Literary Elements covering Setting, Characters, Conflict, Plot, Themes, Mood, Background Information, and Literary/Historical Information. Chapter Summaries with Notes - Chapters 1-30, Overall Analyses of Characters, Plot, and Themes, plus Study Questions, Bibliography, as well as Comment on the study of Literature. SparkNotes: The Grapes of Wrath by John Steinbeck. Contents: Context, Plot Overview, Characters, Character Analysis, Themes, Chapters 1 - 30, Quotations, Facts, Study Questions and Essay Topics, Quiz, and Further Reading. Summary of The Grapes of Wrath (1939). A very short summary from The Martha Heasley Cox Center for Steinbeck Studies, San José State University. Character Sketches Assignment. Quote and profile the characters named: Tom Joad, Casy, Ma, Pa, Uncle John, Al, Connie and Rose of Sharon, Granma and Grampa, Ruthie and Winfield, The Wilsons, Herb Turnbull, Muley, One eyed man, Noah, Grapes theme, Okies. Reference: Writing a Character Profile: Some headings to plan your profile, Possible criteria to judge your profile. Creating Dramatic Monologues from "The Grapes of Wrath" from DiscoverySchool.com. Objectives of lesson plans designed for Grades 9-12 are: Students will understand the universal nature of Steinbeck's characters' struggles and some of the complex forces affecting their lives; and the value of primary source material in presenting an authentic picture of an given period in history. Detailed lesson plans include procedures, adaptions, discussions questions, plus other valuable resources e.g. video clip, vocabulary where you can hear the words (e.g. arable, harrowing, migrant, viracity, vigilante) pronounced and used in a sentence, links to relevant sites, and more. The Grapes of Wrath - Scrapbooks and Artifacts: Ethnographic Field Studies in Fiction. Teacher Lesson Plan by Linda and David Lackey. Recommended Grade Level: 11-12. Teacher's Guide: Introduction to American Memory, Lesson 1: Ethnography, Lesson 2: Photo Analysis, Lesson 3: Oral History, Lesson 4: Material Artifacts and Textual Support, Lesson 5: Museum Exhibition. "The Grapes of Wrath" (1939) Study Site. Assessment of this webquest will be by critical essay at the end of the unit. Materials and teacher resources owned and maintained by G. Smith of Brisbane, Australia. Accompanying Resource Book contains essential resouces, worksheets and assignment tasks. Contents: Teaching Programme, Structure and Orientation, Notes on the John Steinbeck video, Character profiles worksheet, Worksheet 1: reading journal entry, Worksheet 2: the turtle chapter, Notes to follow the video, Summaries, Readers' Forum, grapesviews2, Themes in this novel, Cover illustrations, Essay Topics, Model essay on its theme and structure, Overview writing exercise. Learning Guide to: The Grapes of Wrath. From Teach with Movies. States the educational values and benefits for selecting this film: "This film is an introduction to the Great Depression. It explores the stress of hard times on a family and the oppression of migrant workers by large landowners." Designed for students Grade 6 and up. Provides clear and concise background information on the historical context of the 1940 movie. Includes discussion questions, words and phrases, ethical emphasis, and links to other lesson plans. Life in the 1930s: The Great Depression. An Internet WebQuest on The Great Depression by Paige G. Elliott, Fuquay-Varina High School, Fuquay-Varina, NC. "It is my [Webquest creator's] hope that you will consider others' perceptions in addition to your own. After all, 'perception is reality.'" Teacher Cyberguide: The Grapes of Wrath by John Steinbeck from San Diego County Office of Education. Originally written by Scott Burkhalter, revised by Mary Jewell. Consists of 5 activities designed to provide students with an appreciation of the plight of refugees. Focus on Dust Bowl and Kosovo refugees in an attempt to recognize similarities and differences. Woody Guthrie and The Grapes of Wrath. Rationale for lesson plan: Studying the music of Woody Guthrie along with John Steinbeck's The Grapes of Wrath will enhance students' understanding of both works and of the historical conditions which produced them. Students will see how these artists drew inspiration from the common people and how both attempted to use their art as agents of social change. Objectives: Students will recognize thematic parallels between Woody Guthrie's music and Steinbeck's novel; develop an appreciation for The Grapes of Wrath and the music of Woody Guthrie, (Tom Joad Lyrics) as works of art and historical documents; and explore the idea of the "American spirit." Woody Guthrie Dust Bowl Ballads. Background, Song List includes lyrics: Blowin' Down This Old Dusty Road (1930s), (If You Ain't Got the) Do Re Mi (1937), Dust Bowl Blues (1930s), Dust Bowl Refugee(s) (1938), Dust Can't Kill Me (1938), Dust Pneumonia Blues (1938), Dusty Old Dust (So Long, It's Been Good to Know Yuh) (1935), The Great Dust Sotrm (dust Storm Disaster) (1930s), I Ain't Got No Home (1938), Pretty Boy Floyd (Mar 1939), Talking Dust Bowl (1930s), Tom Joad (1940), and Vigilante Man (1930s). An American Classic: John Steinbeck's The Grapes of Wrath - First Edition. Intact with original beige cloth, original dust jacket. New York: Viking Press, (1939). $3000. The Grapes of Wrath from Top 100 Movie Lists. Includes a poster, photos, sound bites on "I'll be all around in the dark" in Henry Fonda's voice, More Memorable quotes, plus a short Review by Aaron Caldwell. The Grapes of Wrath (1940) from Internet Movie Database (IMDB). Film directed by John Ford. Includes a Mini Biography of John Steinbeck, Photo gallery for The Grapes of Wrath (1940) starring Henry Fonda as Tom Joad, Plot Summary, Memorable Quotes from The Grapes of Wrath (1940), Amazon.com Reviews, Review by Jude Wanniski, Review by Brian Koller. The Grapes of Wrath: Film, Film vs Book, Route 66. Site gives some background information about the 1940 John Ford film of The Grapes of Wrath, and mentions that Hollywood producer Daryl F. Zanuck paid Steinbeck $75,000 for the film rights to his novel within a month of its publication in March 1939. It discusses the differences between the film and the novel, and includes a history of Route 66. It points out that it was this novel "The Grapes of Wrath" that "served to immortalize Route 66 in the American consciousness. Hundreds of thousands of people migrated to California to escape the despair of the Dust Bowl, thus Route 66 symbolized the 'road to opportunity'". Site originates from the University of Vienna, Austria, as part of a course taught by a professor of English and American Studies. Course title: Roads in/of American Culture as Avenues of Cultural Studies. The Grapes of Wrath (1940). Film site. Review by Tom Dirks. The Grapes of Wrath: 'Present at the Creation' Looks Back on John Steinbeck's Epic from NPR.org. Provides background info on Steinbeck's experience with migrant camps in 1930s, plus links to other resources. Here you can Listen to Brian Naylor's report on the story behind the creation of one of America's literary landmarks, Listen to Woody Guthrie's 1940 song Tom Joad, and Watch a video clip of the I'll be There scene from the 1940 film The Grapes of Wrath starring Henry Fonda. "Migrant Mother" Photographs in the Farm by Dorothea Lange, made in February or March of 1f936 in Nipomo, California. Trampling Out the Vintage: Reflections on John Steinbeck and "The Grapes of Wrath". Video. 29 minutes. From UCSD (University of California Television). "The Grapes of Wrath is arguably the most celebrated work of John Steinbeck's illustrious career, and both the play and film based on the novel are classics in their own right. Through archival material and interviews with noted Steinbeck scholars, Trampling Out the Vintage explores the genesis and history of Steinbeck's novel, and examines its perennial hold on the American imagination." Dust Bowl: Men, Dirt and Depression by Mathew Paul Bonnifield. About the Dust Bowl. Photos, map, and timeline. See also The Great Depression. Drought in the Dust Bowl Years. Topics include: 1930s Drought Costs, and Lessons Learned: The Legacy of the 1930s Drought. The Dust Bowl. Brief description with photos and Movie of a dust storm during the Dust Bowl. The Dust Bowl from Humanities-Interactive.org. Click on thumbnails on the left to view larger images. The Dust Bowl and the Depression in American History - Photo Gallery by Debra McArthur of Parkville, Missouri. The Dust Bowl - Trampling Out the Vintage by Charles L. Todd. The Dust Bowl of Oklahoma. America's Story from America's Library. Historical Perspective on Drought, Dodge City, Kansas. Kansas in the Dust Bowl: We Aim to Stay by Susan Chaffin, from Voices: The Kansas Collection Online Magazine. Life in the 1930s: The Great Depression. An Internet WebQuest on The Great Depression. Living with Dust by Lynn Nelson, from Voices: The Kansas Collection Online Magazine. Surviving the Dust Bowl - The American Experience. The 60-minute film "Surviving the Dust Bowl" may be ordered from PBS Home Video. Description: "A moving and poignant look at one of the damaging scourges to blight the United States. When the rains suddenly ceased in the summer of 1931, a period of black blizzards brought financial and emotional ruin to thousands of families in the Southern Plains. The dust bowl was America's worst ecological disaster. Featuring interviews with those who survived its terrible toll, Surviving the Dust Bowl is an emotional tribute to those who endured its traumatic consequences." Site includes Special Features, Timeline of Dust Bowl, Map, Links to People & Events, and a Teacher's Guide. Voices from the Dust Bowl. From American Folklife Center, Library of Congress. The Charles L. Todd and Robert Sonkin Migrant Worker Collection is an online presentation of the everyday life of residents of migrant work camps in central California in 1940 and 1941. Collection consists of audio recordings, photographs, manuscript materials, and publications. View the text of 113 Songs, Listen to recordings of these songs, Browse 363 Audio Titles, 23 Photographs, and Performers/Interviewees from A-Z. Includes The Migrant Experience. Vocabulary Classic Texts: Grapes of Wrath. 88 words selected by Carey & Jan Cook from The Grapes of Wrath by John Steinbeck in order of appearance in five chapter groupings. Site aims to encourage study and provide opportunity for students to learn SAT-College Prep vocabulary in context. Weedpatch Camp (Arvin Federal Government Camp). "While writing The Grapes of Wrath, John Steinbeck lived in Bakersfield, California and based his book on Arvin Federal Government Camp which he portrayed as 'Weedpatch Camp.' This camp exists today and is still used by migrant workers." Here you will see an interesting photo of a migrant "motorhome" of sorts, plus a collection of Web links relating to migrant laborers, e.g. Weedpatch Camp (History, Life in the Camp, Federal government role), Personal Reminiscences, Dust Bowl Festival, Dust Bowl Shop, Migrant Mother, Children of the Dust Bowl (book) - The True Story of Weedpatch School, Dust Bowl / Migrant Workers Bibliography, Voices from the Dust Bowl, and other related links. Site is accompanied with the music of "Blue eyes crying in the rain" in the background. Useful Links. Includes a 1938 photo of a view of the camp for citrus workers, San Joaquin Valley. Web links include: The Grapes of Web - A digital Companion to Reading "The Grapes of Wrath"; National Steinbeck Center; California Center for the Book; Penguin Books; Steinbeck centennial events; Center for Steinbeck Studies, San Jose State University; NPR: The Story behind the creation of "The Grapes of Wrath;" California Views: Collection of Historical Photographs; and Voices from the Dust Bowl: American Folklife Center, Library of Congress.